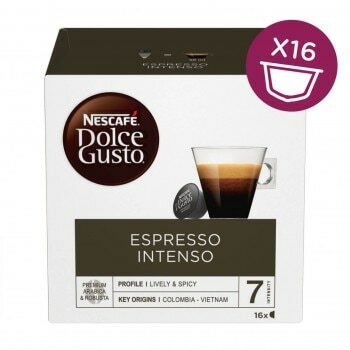 If you love an after dinner espresso, you’ll love Espresso Intenso. One of our medium roast coffee pod drinks, Intenso has a deliciously nutty aroma that adds something extra special to your espresso cup. With a warm, spicy intensity and hints of summery red fruits, our Espresso Intenso pod coffee has a gentle complexity that tastes great at any time of the day. Thanks to the maximum 15-bar pump pressure in our stylish coffee machines, these pods not only make a tasty espresso, but also top your drink with a velvety layer of crema. Honey-coloured and delicious, the silky crema helps your Intenso espresso pod coffee taste great from the very first sip. With wonderful aromas of almonds and cherries, Espresso Intenso is brilliant for savouring after dinner with friends or simply enjoyed as a way to unwind. As well as making coffee shop quality espressos straight out of your kitchen, our Intenso pod drinks look great too. We think these sophisticated coffee pod beverages are best served in an elegant espresso cup that shows off your coffee creation at its best. Why not try out our glass espresso cup set, which presents the lovely layer of crema beautifully, or our funky cup and saucer sets, which make a unique style statement for espresso lovers. Want to add variety to your espresso collection? Check out our wonderful range of espresso pod drinks, each delicious and each bringing something different to the table. Our favourite coffee with my wife, we always order this one. Creamy, not so strong so excellent. I love this coffee. But since I tried different coffees from your shop I must compare and this one loses against Buondi pod from Portugal Dolce Gusto. Buondi is even more creamier and has an unique flavour, which is why Buondi will always be my favourite. Lacking Buondi in uk, this expresso does the job. I would have given 5 if I had never tasted Buondi. A deliciously stron, smooth coffee, full of flavour. A perfect start to the day!! After trying various capsules, I have found the combination to make a perfect coffee shop type beverage. 3/4 mug of milk in the microwave for 40 seconds and then top with the Espresso Intenso and stir. All that's missing is the cardboard cup. Such a smooth coffee, try with 40ml warm milk and a sugar cube to finish...yummy!